Hidradenocarcinomas are very rare intradermal malignant tumours of apocrine origin reported to occur on abdomen, trunk, groin, scalp, elbow, eyelid, digits, shoulder and breast.,, The reported incidence is 0.05%. They have a high metastatic potential, particularly to lymph nodes. Metastases have been reported in more than 60% of patients within first 2 years of diagnosis. We would like to report a case of hidradenocarcinoma presenting with metastasis at multiple sites and discuss the various other tumours (primary and metastatic) from which it should be differentiated as it is quite a challenge to diagnose it correctly on histology. A 55-year-old male patient presented to our institute with an abdominal swelling for 6 months, gradually increasing in size, associated with pain in back and not relieved by medications. On examination, a well-defined lump was noted over the left lumbar region, moving with respiration and fixed to the overlying skin which was otherwise normal. The haematological findings were unremarkable except for a raised total leucocyte count (1200 μ/L). Ultrasound abdomen showed a hypoechoic heterogenous mass measuring 31 mm × 25 mm in the left lower abdominal wall. No organomegaly or any other lesion/tumour was noted. In view of back pain, magnetic resonance imaging spine was done which showed multifocal metastatic deposits in the left paravertebral region at L1–2 level, gluteal region along with enlarged right iliac lymph nodes. Contrast-enhanced computed tomography chest revealed multiple discrete and conglomerate enlarged lymph nodes with areas of necrosis in pretracheal, paraaortic, precarinal, right hilum and bilateral axillary regions. There was an associated lytic destructive lesion in posterior end of the left 4th rib with extrapleural enhancing soft tissue component. Prostate-specific antigen levels were normal (0.57); hence, metastasis from a prostatic carcinoma was ruled out. The liver and renal function tests were unremarkable. This was followed by an excision biopsy of the abdominal wall lump. Grossly, the lump was skin covered and measured 6.5 cm × 3 cm × 2 cm. On cutting, a well-defined tumour was seen measuring 3 cm × 2.8 cm × 2 cm showing areas of necrosis. The overlying skin was adherent but free of tumour [Figure 1]. Sections were taken from tumour and stained with H and E stain. Microscopy revealed a well-defined tumour in the dermis composed of population of cells showing both squamoid and eccrine differentiation. The cells had well-defined cytoplasmic borders, pale to eosinophilic to abundant clear cytoplasm, vesicular nuclei and prominent nucleoli [Figure 2]. Few duct-like structures were also seen [Figure 3]a. Intervening fibrous septa showed extensive acute inflammatory infiltrate. Numerous typical and atypical mitotic figures along with areas of necrosis were also seen [Figure 3]b. The resection margins were involved. 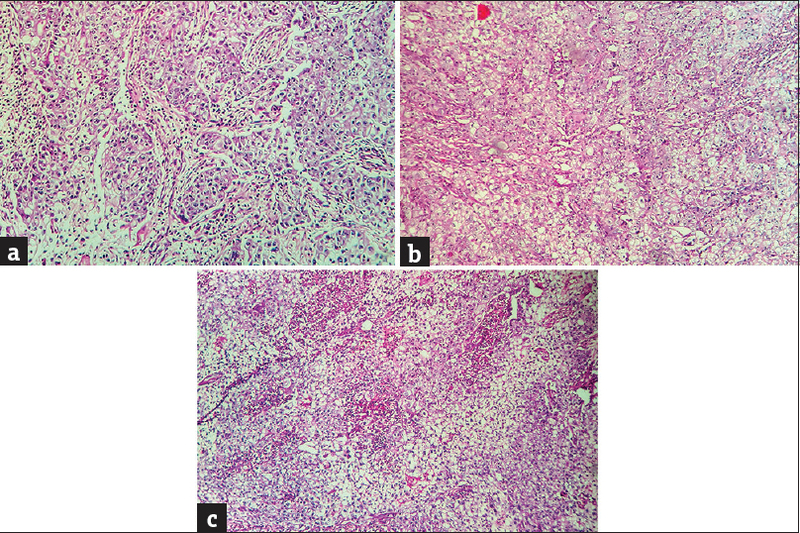 Based on these findings, a diagnosis of hidradenocarcinoma was formed. The clinical tumour node malignant (TNM) stage was T2N2cM1. The patient refused to receive any further treatment having been explained the prognosis and behaviour of tumour and did not turn up for follow-up. Hidradenocarcinomas are very uncommon intradermal malignant tumours of eccrine origin usually diagnosed in the fifth to seventh decade of life with equal incidence in men and women. Typically, it appears as a benign solitary lesion, but multiple lesions form also has been reported. It presents as an asymptomatic, well-circumscribed nodular lesion that either maintains a stable size or may slowly expand circumferentially. At an undefined period, the tumour transforms into an aggressive form that metastasizes to lymph nodes, bones or visceral organs., It is also known to have a high recurrence rate. It accounts for up to 6% of malignant eccrine tumours and represents the malignant counterpart of hidradenoma. The largest study on malignant sweat gland tumours was done by Berg and McDevitt in 1968 which included a total of 101 cases. The differential diagnosis includes other primary skin tumours with follicular, eccrine or sebaceous differentiation such as adenoid cystic eccrine carcinoma (ACC), aggressive digital papillary adenocarcinoma (ADPA) and cutaneous metastatic diseases from clear cell tumour such as renal cell carcinoma (RCC), thyroid and lung cancers., For example, ACC shows basaloid cells arranged in cribriform or tubular patterns with hyaline material. ADPA shows cystic areas lined by papillary structures. RCC shows clear cell population with intervening prominent vascularization. In our case, there was no known extracutaneous primary, so any metastasis was ruled out clinically and histologically. The other adnexal tumours were ruled out on the basis of histology. On immunohistochemistry, these tumours stain positive for keratin AE1/3, cytokeratin 5/6, Ki-67 and P53. Hidradenocarcinoma is highly aggressive tumours and should be correctly diagnosed. The standard modality of treatment is a wide local excision with clear margins. The histological features are challenging and any metastatic tumour should be first excluded in the study. The role of adjuvant therapy is controversial. An inadequate excision of the lesion appears to be a poor prognostic factor because of a propensity to recur locally. The role of adjuvant therapy is controversial. Gauerke S, Driscoll JJ. Hidradenocarcinomas: A brief review and future directions. Arch Pathol Lab Med 2010;134:781-5. Giorgini E, Tugnoli G, Aprile S, Collina G, Villani S, Biscardi A, et al. 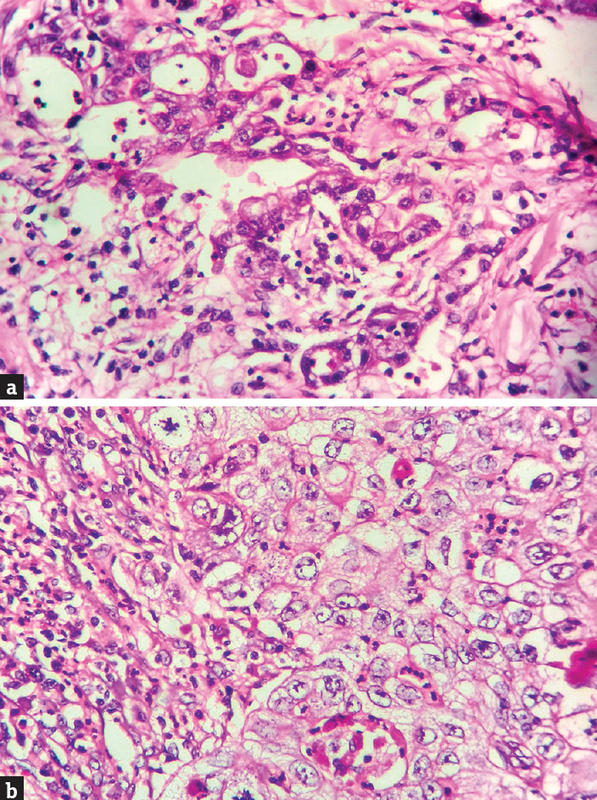 Malignant nodular hidradenocarcinoma arising on the areola of a male patient: Case report of an orphan disease and review of the literature. J Carcinog Mutagen 2012;3:129. Floros P, Mikhail M. A rare case of pectoral hidradenocarcinoma and brief review. Internet J Surg 2010;26:4. Ohta M, Hiramoto M, Fujii M, Togo T. Nodular hidradenocarcinoma on the scalp of a young woman: Case report and review of literature. Dermatol Surg 2004;30:1265-8.
Cooper PH. Carcinomas of sweat glands. Pathol Annu 1987;22 Pt 1:83-124. Asati DP, Brahmachari S, Kudligi C, Gupta C. Hidradenocarcinoma: A rare sweat gland neoplasm presenting as small turban tumor of the scalp. Indian J Dermatol 2015;60:421. Berg JW, McDevitt RW. Pathology of sweat gland carcinomas. Pathol Annu 1968;3:123-44. Kazakov DV, Ivan D, Kutzner H, Spagnolo DV, Grossmann P, Vanecek T, et al. Cutaneous hidradenocarcinoma: A clinicopathological, immunohistochemical, and molecular biologic study of 14 cases, including Her2/neu gene expression/amplification, TP53 gene mutation analysis, and t(11;19) translocation. Am J Dermatopathol 2009;31:236-47. Volmar KE, Cummings TJ, Wang WH, Creager AJ, Tyler DS, Xie HB. 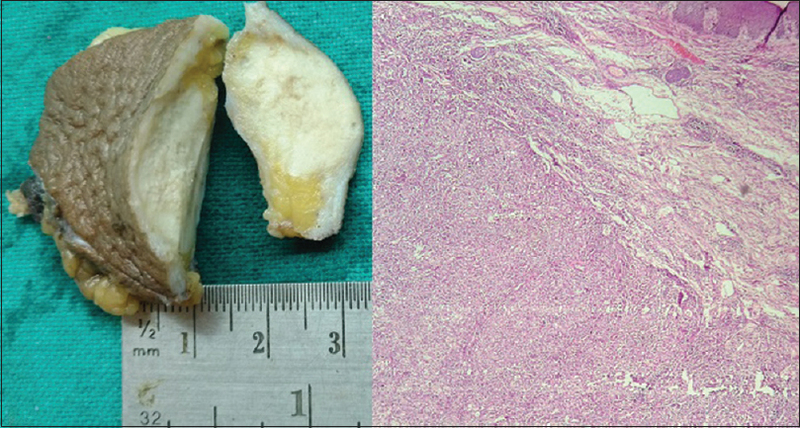 Clear cell hidradenoma: A mimic of metastatic clear cell tumors. Arch Pathol Lab Med 2005;129:e113-6. Ko CJ, Cochran AJ, Eng W, Binder SW. Hidradenocarcinoma: A histological and immunohistochemical study. J Cutan Pathol 2006;33:726-30. Souvatzidis P, Sbano P, Mandato F, Fimiani M, Castelli A. Malignant nodular hidradenoma of the skin: Report of seven cases. J Eur Acad Dermatol Venereol 2008;22:549-54. Garcia-Bonafe MM, Campins MM, Redecilla PH. Malignant nodular hidradenoma on the scalp: Report of a case with fine needle aspiration cytology features and histologic correlation. Acta Cytol 2009;53:576-80.